The church building where Christ the Savior is now housed was once the property of the Apostolic Catholic Church. The denomination, an offshoot of Anglicanism, was organized in 1835 in Scotland. By the late 1900’s the denomination was in decline and parishes were closing their doors, one by one. While the customary practice of the Apostolic Catholic Church was to offer their buildings back to the local Episcopal diocese because of their Anglican heritage, when their doors closed, the congregation at North LaSalle wanted to explore other options. After a series of conversations and negotiations, it was agreed that the church and residence next door would be given to the OCA and that the Diocesan property in Oak Park would be sold. Proceeds from the sale of the Oak Park property would be used to restore the residence. The property was finally acquired in 1996. On August 16, 1997, the parish’s patronal feast day, the church held its first service as well as a preliminary blessing for the temporary iconostas which had been completed the day before. For the next year, services were sporadic as efforts were undertaken to restore the church and residence. By Thanksgiving 1998, the church had to close again for extensive renovation. Consistent services began the following February on the Sunday of the Publican and Pharisee at the beginning of the Lenten Triodion with Fr. Luke Nelson serving. Students are a vital part of the community of Christ the Savior. The parish reaches out to students, seeking to create a home away from home, where they can they grow spiritually and have their gifts used. In turn, they bring fresh energy and a wealth of talents to the community. Fr. John Baker came to Christ the Savior parish in the fall of 2004, bringing his own great energy and dreams for the parish. As a carpenter by trade, he was able not only the build up the parish spiritually, but also physically. The past few years at Christ the Savior have been an exciting time of reaping from the earliest seeds. The community has grown and become more financially stable, and the church has become more and more beautiful, thanks to the vision and tireless labors of Fr. John Baker and the committed members of Christ the Savior. 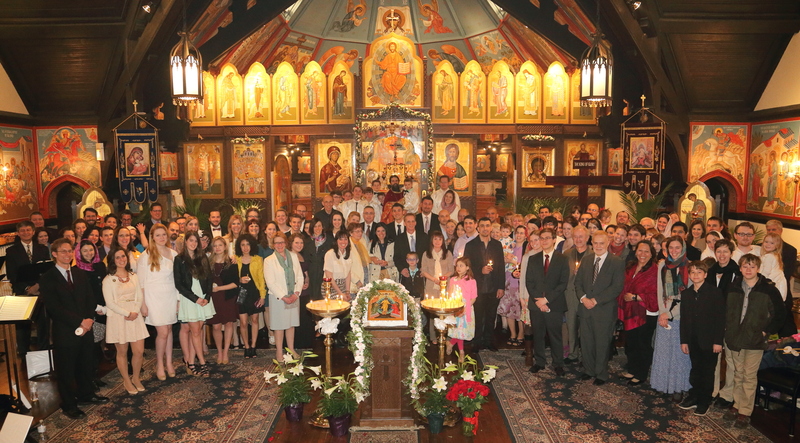 Perhaps the most exciting milestone for this community was the installation of the new iconostasis, completed just in time for Pascha of 2007. The iconostas represents years of labor and generosity. Symbolically, it represents the movement from a fledgling mission to full-fledged, thriving parish.